This week, Ruth’s past was able to provide herself and others a measure of comfort when she was given the chance to help a family which experienced a similar trauma in one of the most recent horrific attacks to strike Israel. This past summer, the Salomon family was finishing up their Friday night meal when a terrorist burst into the home in the town of Neve Tzuf (Halamish) and stabbed three people to death, Yosef Salomon, 70 and his daughter Chaya, 46 and son Elad, 36, a husband and father of five young children. Over Hanukka the two families’ stories of tragedy converged when Ruth was chosen to serve as a babysitter for Elad’s younger children during a special holiday gateway for women and children who had lost a loved one to tragedy. The program, now in its 16th year is coordinated by Colel Chabad, which founded in 1788 is the longest running charity in Israel, and is intended to give these families a chance to experience Hanukka alongside others who have experienced similar loss in their lives. Ruth says she accepted the responsibility of helping the young Salomon children who had experienced something very similar to what she had gone through when her father was killed- albeit with some trepidation. “My message to the kids is to try - however difficult it might sometimes seem - to find the good in life because it’s still there.” And she says that despite her nervousness that this role would cause her to recall many of the traumas that defined her earlier years, the effect of seeing children who can remain happy despite the horrors they’ve experienced is invigorating. 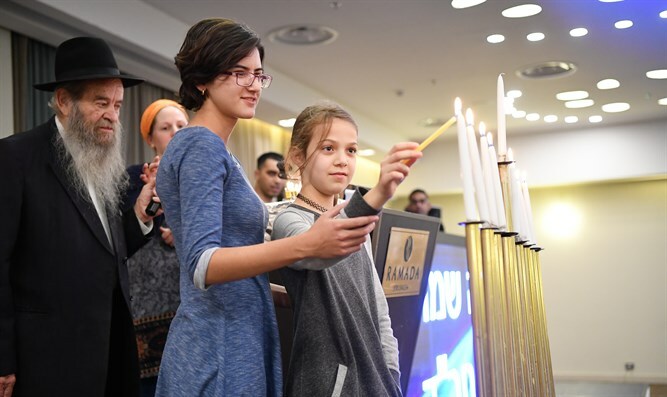 The Colel Chabad gateway welcomed a total of 50 mothers and 300 children – all of whom had lost their father to a terror attack, tragedy or illness. The program is just one part of the Chessed Menachem Mendel initiative which follows these families throughout the year providing them with financial, social and academic support. The Hanukka program takes place at the Ramada Renaissance Hotel in Jerusalem and includes entertainment, meals and day trips and gifts. Childcare and help by those like Ruth is provided throughout so the mothers can relax alongside their families. All expenses are covered by Colel Chabad and the Finger family. “Hanukka is both a time of joy and loss for these families and we work to help them focus on the joy while still remembering family members who are no longer with us," said Rabbi Sholom Duchman, director of Colel Chabad. "This is achieved by dynamic programming that promotes happiness and entertainment but doesn't dismiss the fact that these children and families aren't celebrating the holiday in a complete way. So our goal is to provide hope but not ignore the loss."